Dorothy Ellis, age 78 of Grinnell, died on Wednesday, January 30, 2019 at her home in Grinnell. A memorial service will be held at 10:30 a.m. on Tuesday, February 5th at the Smith Funeral Home in Grinnell with Rev. John Epperson officiating. A reception will follow the service at the Eagles in Grinnell. Visitation will begin at 2:00 p.m. on Monday at the Smith Funeral Home and the family will receive friends from 5:00 p.m. until 7:00 p.m.
Memorials may be designated to the Dorothy Ellis Memorial Fund and mailed in care of the Smith Funeral Home, PO Box 368, Grinnell, Iowa 50112. Memories and condolences may be shared with the family online at www.smithfh.com. Dorothy Gale Kroehnke was born on October 25, 1940 in Grinnell, Iowa to Frank Louis Kroehnke and Donna Bernice (Shaw) Kroehnke. She was raised in Klemme, Iowa and graduated from Belmond-Klemme High School in 1957. In April of 1966 Dorothy was united in marriage to Larry Ellis in Grinnell. The couple lived in Grinnell and Dorothy worked at Goodyear Tire and later for Jeld-Wen Windows in Grinnell. 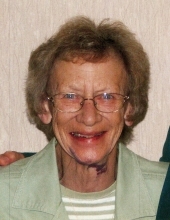 She was a longtime member of the Eagles in Grinnell, where she was a past president and secretary for over fourteen years with the Eagles Auxiliary. Dorothy enjoyed traveling with Larry to Eagles events throughout the United States. She also enjoyed bowling, golfing, going for motorcycle rides, and giving Larry a hard time. She held a special love for animals and there wasn’t a stray cat in her neighborhood that wasn’t cared for and fed. Dorothy is survived her husband of 52 years, Larry Ellis of Grinnell; stepdaughter, Chris Goodrich of Brooklyn; step grandsons, Justin (Bethany) Goodrich of Ladora and their daughter, Emery, Matthew Goodrich of Brooklyn, Zachary Goodrich of Brooklyn, and Charlie Goodrich of Brooklyn; nephew, Don Ellis of Grinnell and his children, Donnie and Stacy, both of Grinnell. Dorothy was preceded in death by her parents; and half-sister, Doris Broders. To send flowers or a remembrance gift to the family of Dorothy Ellis, please visit our Tribute Store. "Email Address" would like to share the life celebration of Dorothy Ellis. Click on the "link" to go to share a favorite memory or leave a condolence message for the family.